My first stop in Costa Rica was Monteverde, a wonderful area of coffee plantations, zip line adventure companies, ecological preserves, rainforest and the worst roads you’ve ever had the mis/fortune to ride on. The slash there in case you’re a fan of bumping over potholes that could swallow most small cars. In Canas, catch a difference bus to Tilaran. That’s pretty much an entire day of being on and off buses. So when we were approached by a man offering a ride to Tilaran for $60, we…realized he didn’t speak English, and we didn’t speak Spanish. Much miming and broken sentences in both languages later, we offered $50, and off we went. We arrived in Tilaran around 9:30, and were again approached by a different man, who offered us a ride to Monteverde for $70. Again, we found ourselves awkwardly debating the price, and finally we all agreed on (and understood) $60. So we piled in his car, started off…..and he asked if he could bring his wife. Turns out, I think (remember, I don’t speak Spanish) he and his wife are from Monteverde and they were going to use the day to visit their family. Did we get taken? Most likely. We could probably have talked both men down more, but honestly….we were tired, and we had the money. Arriving in Monteverde, we found our hostel, and booked a coffee plantation tour at El Trapiche – where they grow not only coffee, but also bananas, plantains, sugar cane and pineapples. We toured through the bananas and plantains, and then headed into the sugar cane, before getting to the good stuff. The coffee. 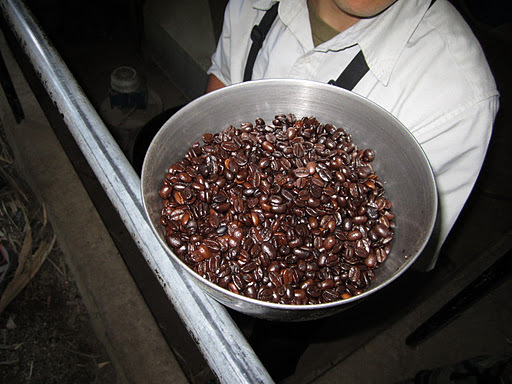 Seeing it in all its stages – how it’s grown, dried, the bean separated from the kernel, and then roasted, was incredibly interesting. 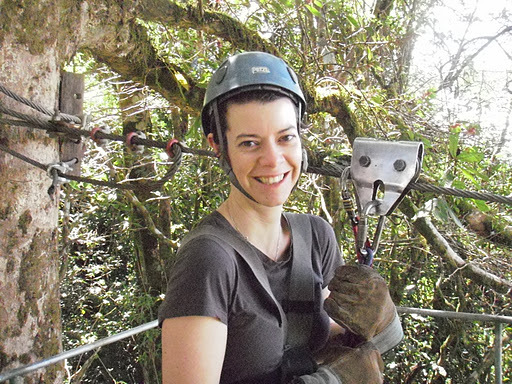 The next day, we headed out to Extremo Park to do a little zip lining. There are multiple zip line companies in Monteverde, and I think most of them are fairly similar. Extremo offered a 1km long “superman” zip line – where you fly like superman from one mountain top to another. It’s a fairly bare bones operation, in that it’s only zip lines (with one 55m repel, and a tarzan swing) and no canopy tour or suspension bridges, which some of the other companies do offer. While it is bare bones, it doesn’t scimp on safety. 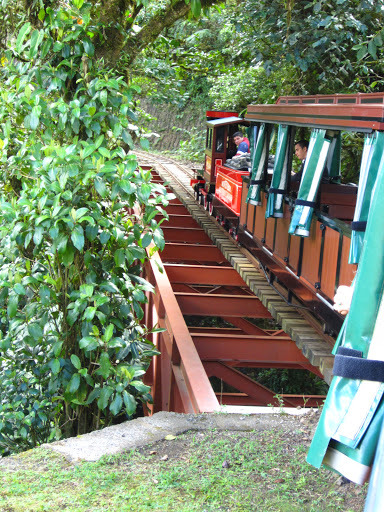 Our final day in Monteverde, we hit the Trainforest (great for kids! ), the Serpentarium, and the Ranario butterfly garden and frog pond. (Although, it’s not really a pond, more of a small frog zoo.) That evening, we did a night walk in one of the ecological parks near the town. While we didn’t get to see many mammals (other than a coati), we did get to view several bird species, and a tarantula. Monteverde is a beautiful area in Costa Rica. As it is in the clouds, there is occasionally a fine mist in the air. 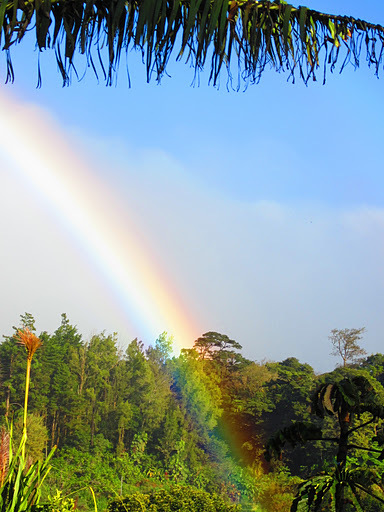 Blue blue skies above you, a warm mist around, and suddenly…..one of the most vibrate rainbows you’ve ever seen. Who could pass up a chance to see that?! I grew up in a small town in a large province very far away from any ocean. Two days driving in one direction would get me to the Atlantic. Four days driving in the opposite would get me to the Pacific. However, I did grow up surrounded by water. Rivers, lakes, puddles, ponds, pools….swimming, canoeing or just playing around. I love water, and every time I hit an ocean I’m reminded again of just how much. 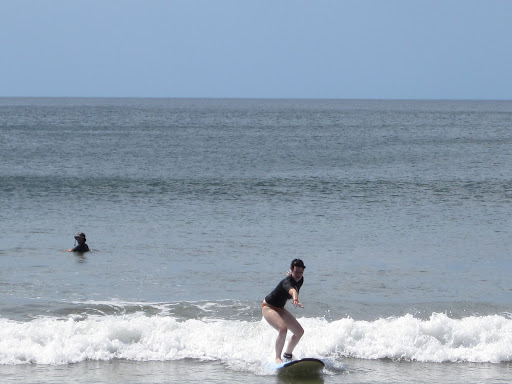 While in Costa Rica, I decided that I needed to take a surfing lesson. I had wanted to in Hawaii, but didn’t find the time. There would be no excuses this time. I contacted Point Break Surf and booked a lesson for January 2. There were two other women 9sisters from LA) taking lessons with me. We started with a how-to demonstration on land – how to paddle, how to stand, how to stay safe. Afterwards we hiked our boards down the beach to an empty stretch where we wouldn’t hit the real surfers with our beginner bumblings. The first time on the board in the water, we just body-surfed the board to the beach. The second time, we rode it on our knees. On the third try, we were to try to stand up. Standing up proved not to be the problem for me – staying standing is where I needed to put in a little practice. 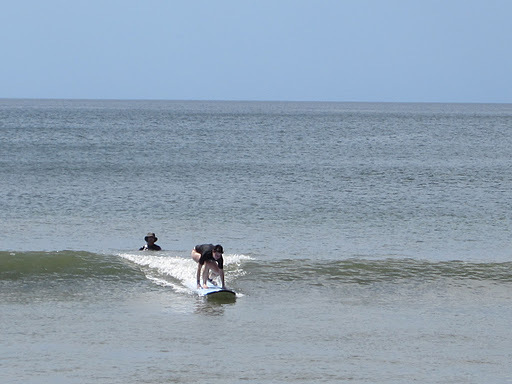 The next try, though, I managed to ride the bunny-wave (borrowing some ski terminology here) to the shore. We were just riding the white water – small waves that wouldn’t prove too much for our meager abilities. Hey, everyone has to start somewhere right? Gotta learn to stand before you can ride. I did not too bad – every other wave I fell off, true, but I rode as many as I floundered. 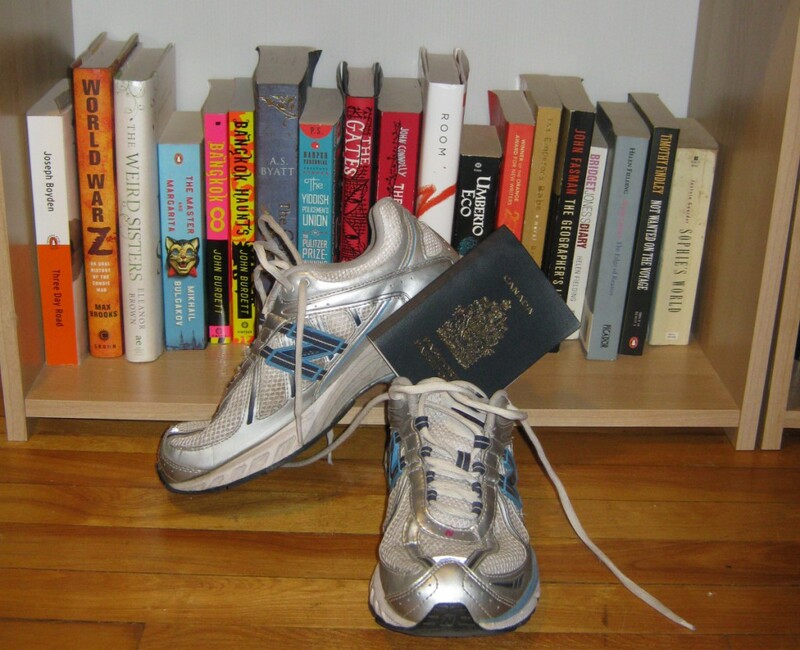 It’s a learning curve – learning when to start standing, learning how fast (or slow) to do the litany of steps towards standing (ok, so….on my knees like a table, check. One foot between hands, check. Start standing and turn body, check. Eyes on the beach! check. Knees bent, check.) 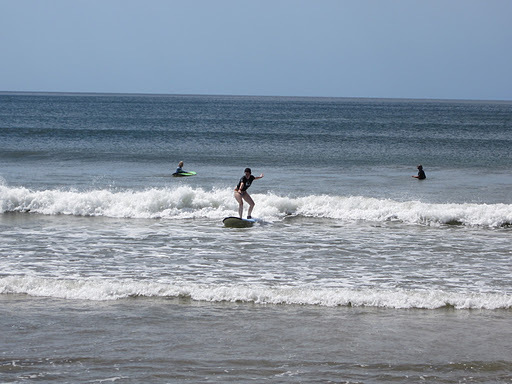 But I (somehow, someway) managed to stand on a few waves. 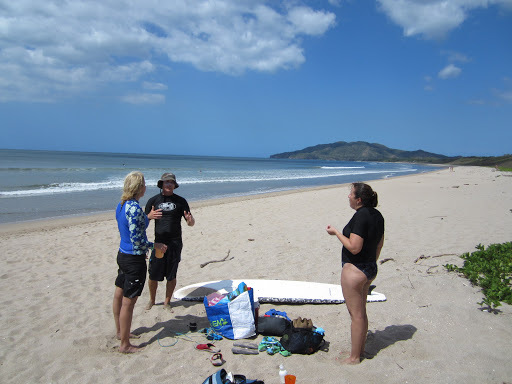 A quick break for water that wasn’t salty, and a new application of sunscreen, and we were back in the water. I was given a different board – one that was a little more stable than the others. I got to ride two or three waves when suddenly, I pearled. (That is to stay, I dived nicely off the front of the board, as if I were diving for perals). The board flew out behind me, and I hit the water, with a sharp pain hitting my knee. I looked down, and it turns out I had gashed it pretty good. 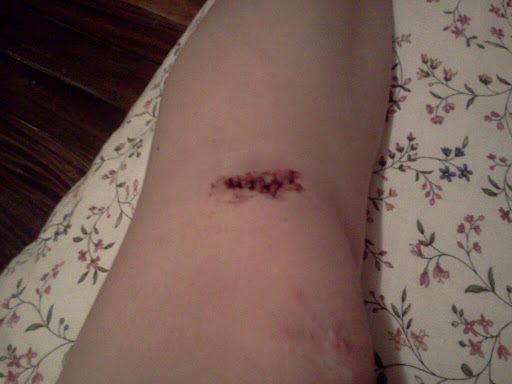 The new board had a mount in it for a camera, and that mount hit my knee, cutting it pretty good. I was lucky – my instructor, Matt, was cool and calm. He grabbed his med kit, bandaged up my knee, and took me straight to his doctor. She took a look at my leg, and set to fixing me up. 6 stitches later, Matt drove me back to my hotel, and made sure that I was ok and didn’t need anything. I’m a little bummed that I didn’t get to surf more. I had a fantastic time, and Matt was a great instructor. It’s definitely something that I’ll be doing again, regardless of the accident. Once my leg heals up, I’m getting “Playa Grande, Costa Rica” tattooed around the scar. It’s an awesome souvenir!